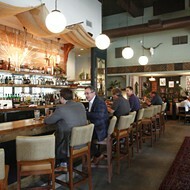 Fact: Mother’s Day is the most popular day of the year to eat in a restaurant. Fact: You are broke. Fact: Moms are suckers for goopy Hallmark card-type sentiment, while you prefer a more rigorous, inventive expression of universal feelings. 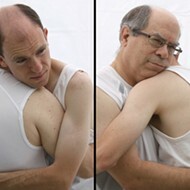 Performance artist Brian Feldman’s 24 Minute Embrace may just meet all of your requirements for a Mother’s Day observation. The conceptual artist (formerly local, though he moved to D.C. a few years ago) is remaking his 2011 Orlando work, 24 Hour Embrace (After Young Sun Han), in which he hugged his father for all of Father’s Day. For this Mother’s Day variant, he will hug Marilyn Wattman-Feldman for 24 minutes (a minute for each hour of Mother’s Day! There’s that goop moms love). This is actually only one-third of Feldman’s latest piece of time-based art – he plans to repeat the 24-minute hug in two other cities, as he and his mother travel to D.C. and then Philadelphia – but as far as you and your own mom are concerned, it’s plenty. Take a picnic to nosh on Seneff Arts Plaza after the performance and skip the busy restaurant buffets altogether.